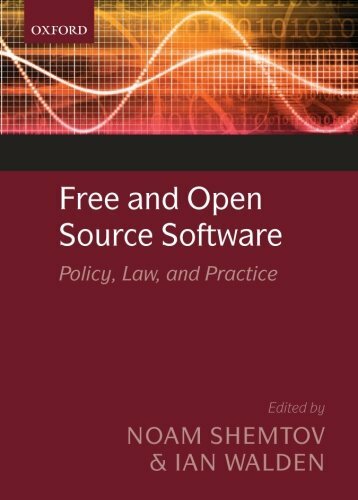 Free and Open Source Software (FOSS) is realised through legal instruments, private law agreements, licences, promises, and community norms. These private law instruments reside within a public law framework that grants exclusive and monopoly rights to creators of intellectual property. Written by FOSS experts, this work delivers an in-depth examination of the legal and commercial structures relating to the usage and exploitation of FOSS software. FOSS has become an increasingly important component of the ICT industry, embodied in the products that we use and the systems we depend on. Major industry players such as IBM have embraced FOSS and it impacts on all its users. This work will enable readers to understand the legal environment within which FOSS operates. The first part examines FOSS in relation to the key IP regimes. The commercial implications of FOSS are then examined from different components of the supply chain. The final part examines the implications of FOSS for policy makers. Dr Noam Shemtov is senior lecturer in Intellectual Property and Technology Law at the Centre for Commercial Law Studies at Queen Mary, University of London. He is the LLM course convener for Intellectual Property and the Creative Industries. He is also the Programme Director for Certificate in Intellectual Property and the Certificate in Trade Mark Law and Practice. Noam is also a visiting lecturer at Universidad Autonoma de Madrid and is a qualified solicitor both in the UK and in Israel. Dr Ian Walden is Professor of Information and Communications Law and Head of the Institute of Computer and Communications Law in the Centre for Commercial Law Studies, Queen Mary, University of London. His publications include Telecommunications Law and Regulation (Editor, OUP, 4th ed., 2012). Ian has been involved in law reform projects for the World Bank, the European Commission, UNCTAD, UNECE and the EBRD, as well as for a number of individual states. Ian is a solicitor, Of Counsel to Baker & McKenzie and is on the Board of the Press Complaints Commission.